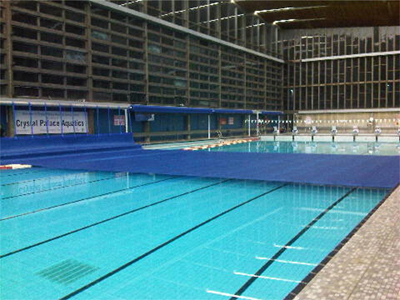 Aquamat pool covers have been specified to help tackle the energy efficiency requirements at the recently refurbished National Sports Centre at Crystal Palace, which will be used as a training facility during the lead up to the London 2012 Olympic and Paralympic Games. The £13 million project at Crystal Palace has included an installation of a combined heat and power (CHP) based system which has been funded by the London Development Agency (LDA). The nationally significant, mixed sports facility owned by the LDA and operated by Greenwich Leisure, contracted Vital Energi to specify pool covers to help reduce total energy costs by up to £400,000 per annum. For this, the biggest swimming complex in the UK today, Aquamat manufactured and installed covers and electric reel systems for the 50m x 20m Olympic sized pool, 20m x 20m diving pool, 7m x 20m infant pool and a 20m x 8m learner pool. The use of Aquamat’s 6mm Heat Retention Covers on each pool were particularly suitable due to their heavy-duty closed polyethylene foam meaning it gave Crystal Palace huge savings on fuel bills from the reduction in heat loss from the surface of the pool. Aquamat’s 3m high Opal roller was used for each pool, which was designed and wall mounted by them. Due to Aquamat’s flexibility they were able to fit each roller to Crystal Palace’s requirements. Fitted with a 24v DC motor, the rolling tube will provide additional safety and keep running costs to a minimum each year. Substantial savings in energy and carbon emissions on the whole project is being achieved with payback times on investment in less than three years. The project has estimated carbon dioxide savings of up to 1,850 tonnes per annum for 20 years. The savings in running costs will also greatly enhance the future viability of the Sports Centre. The £15 million Moor Park Health and Leisure Centre development in Blackpool features an eco-friendly drainage system which has been incorporated into the play area and park around the scheme. It is thought to be the first sustainable urban drainage scheme (SuDS) in the country designed to be part of a play area. Civil and structural engineering company BSP Consulting, of Pride Park, worked in association with Ashby de la Zouch developer LSP Developments and Tamworth architects West Hart Partnership on the Blackpool centre, a three-storey development that includes three GP surgeries, PCT outpatient services, as well as a library, gym and swimming pool. The team previously worked together on a similar scheme at Freshney Green, Grimsby, which last year won the HealthInvestor Property of the Year Award. “The scheme at the Blackpool development is particularly unusual because it contains no underground surface water drainage, so all the surface water run-off from roofs and hard-standing areas is managed above ground through a combination of ponds and ditches which take the water away from the building and allows it to dissipate into the park area beyond,” said structural engineer Paul Whittingham, BSP’s project manager for the scheme. The SuDS scheme was designed by landscape architect Dave Singleton. 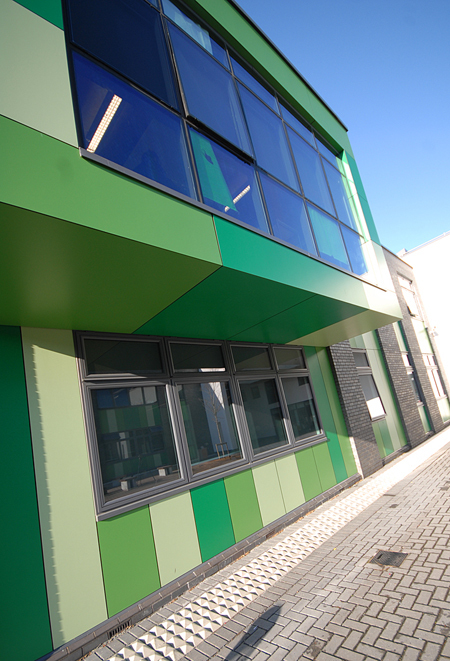 Around 1,400 energy efficient IG units from FGI’s Everseal range are creating a sense of light and space at the new Saint Paul’s Academy in Greenwich, south east London. The vibrant new building, featuring huge expanses of glass and sweeping curves, provides a purpose-built learning facility for 1,200 pupils as part of the Building Schools for the Future programme. The high performance Everseal IG units specified for the project were assembled using Saint-Gobain’s 6mm Cool-Lite solar control glass and 6.8mm laminated clear glass. Everseal’s technical team supplied a range of spectrally selective glazing samples to assist the specification process. “Cool-Lite was chosen because it offered the best compromise between light transmittance and the level of solar energy entering the building,” said Paul Newcombe, head of commercial projects at FGI. Cool-Lite blocks out up to two thirds of heat by reflecting it to the outside, reducing the need for air conditioning in warm weather. And when assembled in double-glazed units this multifunctional glass also offers excellent thermal insulation, making it an energy saving glazing solution for all seasons. The glass has a microscopically thin coating on one face, which gives it a highly attractive appearance and reduces glare, while still allowing in plenty of natural light. FGI Everseal was also able to meet a fast track supply programme and provide a Hiab delivery service on fully certified stillages in accordance with health and safety considerations on site. 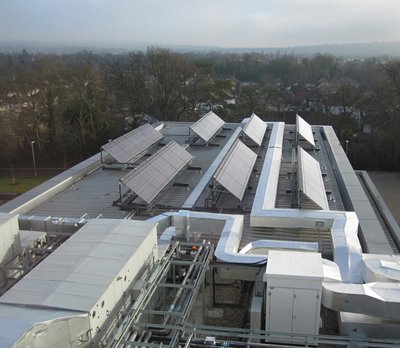 As part of a major £61m investment, including a new 18,000 educational building for its students, East Surrey College has installed 1050 Kingspan Renewables Thermomax solar thermal vacuum tubes to service its annual hot water needs, which significantly cut carbon emissions and lower energy costs. 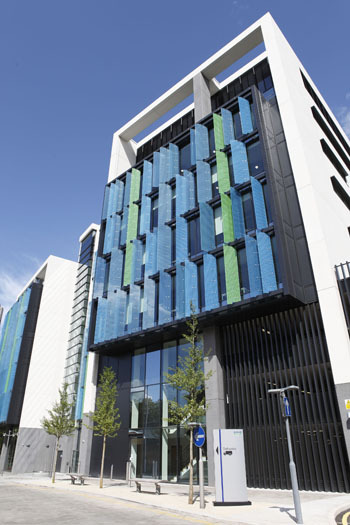 The new landmark building in Redhill has been awarded a BREEAM rating of ‘Very Good,’ with the large-scale solar thermal installation complemented by rainwater harvesting for toilet flushing, a wood chip fuelled biomass boiler and translucent cladding panels for thermal insulation and high levels of natural daylight. Specifically tailored for Northern European climates, Thermomax vacuum tubes provide up to 70% of hot water requirements throughout the year. The vacuum inside each tube allows energy from the sun to be collected efficiently and effectively and provides perfect insulation by protecting the system from outside influences, such as cold, wet or windy weather. The rapid conductivity and transfer of energy into heat means the collectors are up to 30% more effective than traditional flat plate panel equivalents. City South Manchester, a housing trust with over 5,000 properties, chose high performance Styrofloor floor insulation boards from Panel Systems to carry out a major refurbishment for a residential property that had suffered flood damage. The property in Hulme near Manchester needed a complete refurbishment, which included removing existing insulation and a suspended floor and replacing it with Styrofloor, an insulated floor panel, which comprises chipboard and Styrofoam, a thermally efficient extruded polystyrene. 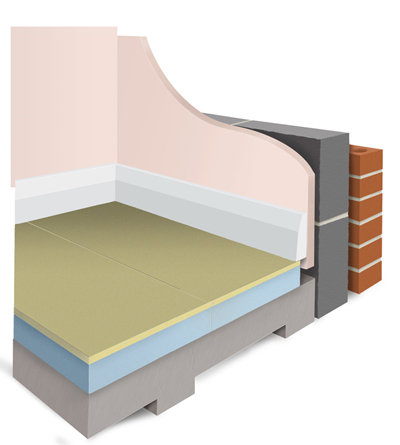 Styrofloor is an easy to lay insulated flooring panel for both new builds and refurbishments. It combines insulation and floor finish in a compression-resistant panel, while eliminating the need for a final screed. Panel Systems, which manufactures Styrofloor, has reported strong demand for its insulated boards from local authorities, housing associations and contractors looking for a quicker, more efficient method of insulating buildings. Panel Systems also offers an ‘A’ grade Styrofoam as the core material which has environmental benefits, for projects where sustainability is crucial. This material uses carbon dioxide as the foaming agent, with an ozone depletion potential of zero and global warming potential of one. An award-winning city centre regeneration project in Wakefield is one of the first applications of a new addition to Technal’s MX aluminium curtain walling suite – the MX62 option developed to accommodate larger dimensions and maximise natural light. Designed by Carey Jones Chapmantolcher, the first phase of the £140m Merchant Gate development is located in the heart of Wakefield’s historic Civic Quarter and has created a vibrant new centre for business, leisure and living. Five high specification buildings and a multi-storey car park feature more than 2,600m2 of Technal’s facade systems, fabricated and installed by Dortech Architectural Systems. The MX62 curtain walling was used for the ground floor retail units on each block, achieving large unsupported spans of up to 4.5m. This latest option from Technal enables architects and contractors to specify even larger sizes of glass to help reduce the reliance on artificial lighting. A maximum weight of 600kg per transom can be specified for MX62, compared to up to 400kg for the standard visible grid system. It is available in three mullion/transom sizes – 80mm, 140mm and 200mm for further design flexibility, and will accommodate 8mm to 44mm glazing as a flat facade. At Merchant Gate, Technal’s MX Visible Grid system was specified as bands of curtain walling for the upper floors of buildings E and F. This ribbon effect is ‘broken up’ with the introduction of glazed spandrel panels in shades of green, yellow and blue. In other areas, panels of glazing were set into resin concrete tiles and contrasting natural timber-faced laminate cladding panels. The curtain walling was faceted to two corner elevations and also encloses the full height stair cores for the commercial and residential elements and the car park. Finished in dark anthracite grey, the MX system carries a variety of glass specifications to meet the acoustic and solar control requirements according to the orientation of each elevation. Top hung concealed vents provide natural ventilation throughout. TWS Leeds recently underwent a comprehensive environmental review of the resources they use, from pollution prevention, waste management and recycling. Tony Grindley owner of TWS Leeds said: “As part of our existing environmental policy, and our commitment to on-going improvements in our operations production facility, we wanted to ensure that none of the recyclable waste we generate ended up in landfill. “We’ve also now established our own in house recycling facility at our purpose built site in Garforth. All the post consumer wooden and PVCU frames we remove from our customers homes are now segregated and the glass removed, this ensures that the three main waste streams we produce are all 100% recycled. 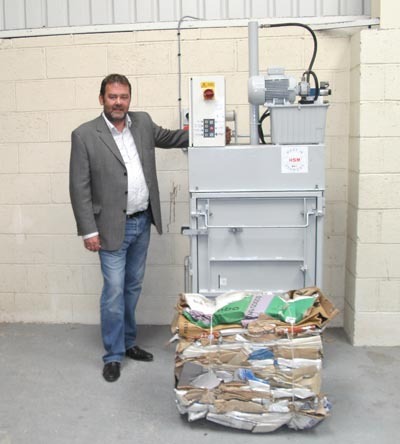 “As part of the environmental review we’ve also invested in a waste compactor which compacts both our cardboard and polythene packaging waste. “The benefits of waste segregation and recycling are instantly obvious as not only have we become more environmentally responsible, we’ve also at the same time saved thousands of pounds a year in landfill tax charges. A 500kW system has been completed in Ransomes Europark, Ipswich. EZsolar managed to complete this project just before the new FIT was implemented. Electricity from solar energy was created through high efficiency PV modules installed on the roof. The City Council granted the planning permission to EZsolar which has been responsible for the design and installation. The photovoltaic panels, which represent the largest part of the cost of the installation, weigh 15kg each, weighing 32 tonnes, were well within the loading capability of the roof. All panels were mounted on frames to improve their elevation to the sun. Four 100kW inverters made by Zigour were used to achieve the installation. 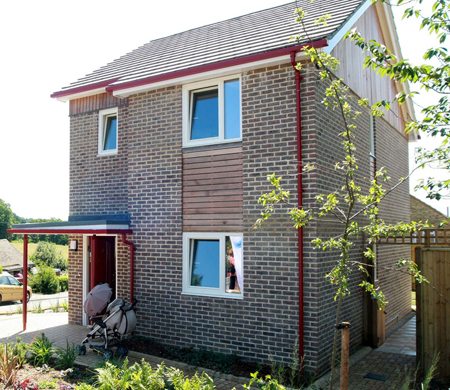 Town & Country Housing Group (TCHG) in Kent decided to construct a low carbon prototype home to act as a test bed for building to level 5 of the Code for Sustainable Homes. In the process they used the H+H Thin Joint system with large format Jumbo Bloks. The house is designed to be as energy efficient as possible, resulting in low running costs for the occupants. Essential to this is a ‘fabric first’ approach whereby the building structure is constructed to be extremely airtight and thermally efficient to reduce heat loss to a minimum. Using Thin Jointed aircrete significantly contributed to this way of building. Paul White, TCHG design and quality manager said: “We used H+H aircrete blocks for the project for their high recycled content as well as their inherently high insulative qualities. This allowed us to construct thinner external walls than alternatives on a tight site whilst still achieving a low U-value. The home is designed to fit in with others in the area and cost £205,000 to build (including the renewable energy technology that was being trialled), on land already owned by the housing group. Hanson Formpave supplied nearly 2,000m2 of its EcoGranite paving for the construction of pedestrianised zones at SusCon in Dartford. EcoGranite is the company’s environmentally aware alternative to natural granite, with up to 77% recycled content. 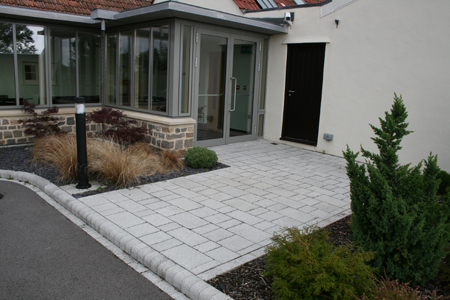 Working in partnership with laying specialist, Interlock Paving, Hanson Formpave supplied 1600m2 of EcoGranite in Natural Cornish, sparkling white granite with black flecks and 225m2 in Balmoral, black granite with white flecks. Architect, Stephen George & Partners LLP was responsible for specifying the necessary sustainable building materials, a task which included a major research programme into the green credentials of the products. This research programme paid dividends and resulted in SusCon being awarded a BREEAM ‘Outstanding’ rating with a score of 88.85%, following a recent BREEAM Education 2008 design stage assessment. 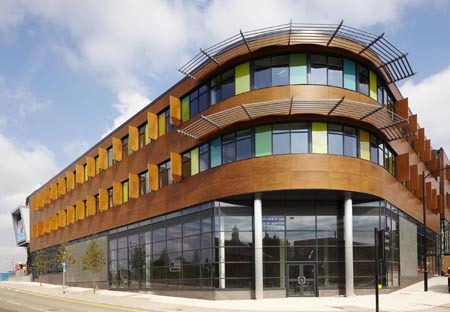 At the time of the assessment this was the highest BREEAM score ever achieved for an education building. James Nicholls of Stephen George & Partners LLP said: “EcoGranite is already a popular choice with architects and specifiers thanks to its sustainable credentials. We have been able to specify a product that meets both our aesthetic and environmental demands, without compromising on quality. Promoting excellence in construction skills and learning, the £5 million building for a public/private partnership, led by Dartford Borough Council, Prologis and North West Kent College, also acts as a demonstration project designed and constructed using a wide range of sustainable products, methods and technologies. Main contractors, Winvic, managed the construction of the new centre. EcoGranite delivers the appearance; performance and benefits associated with a natural granite product without the environmental impact. The unique mix includes stent and slag, by-products of Cornish China Clay and the South Wales steel industry, helping to minimise the drain on natural resources and avoid energy intensive quarrying processes. With a regular surface and consistent joint widths, EcoGranite provides a non slip-skid surface, juxtaposed by a seemingly smooth, sparkling finish; working together to produce an aesthetic, pedestrian-friendly paving. Tenants in North Tyneside are benefitting from reduced electricity bills thanks to a donation of 8,500 energy saving light bulbs by Kier North Tyneside as part of an initiative to promote energy efficiency amongst the council’s 16,000 residents. Kier North Tyneside, a joint venture company between Kier and North Tyneside Council, donated the bulbs while carrying out repairs and maintenance works in conjunction with the council’s better homes department. The aim of the donation was to help reduce tenants’ energy bills and offer tips on leading an environmentally friendly lifestyle to the residents of North Tyneside. Energy saving light bulbs use up to 80% less electricity than a standard bulb but produce the same amount of light. In turn, using less electricity results in properties producing less carbon dioxide, which is one of the main causes of climate change. According to research by the Energy Saving Trust replacing all the bulbs in a property could reduce household electricity bills by £50 per year and up to £390 over the lifetime of the bulbs. In addition Kier North Tyneside gave 200 bulbs to the Salvation Army to be given away to its service users. The bulbs were donated to Kier North Tyneside by The Rotary Club of Monkseaton Centenary, one of 68 clubs in the north-east of England and part of a worldwide service organisation of around 1.2 million people in more than 200 countries. The club’s aim is to give service to those in need, whether in local communities or abroad. 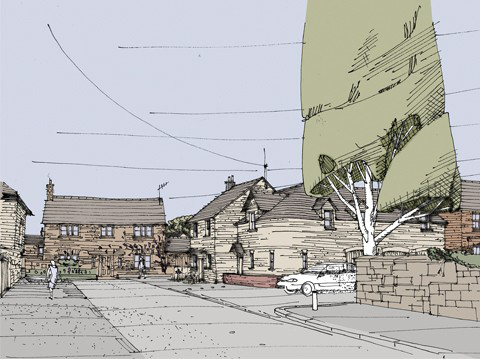 Outline planning permission has been granted for a new development of 1,096 homes at Oakham, the County Town of Rutland. Design, environment and energy consultancy LDA Design was appointed by Hawksmead to prepare a masterplan and design codes for a 60ha sustainable residential extension. The masterplan's vision is to create a mixed-use development of residential, retail, healthcare, amenity and employment uses set within a characteristic Rutland landscape. The development will link with the existing urban grain of Oakham and provide an attractive gateway to the town from the north. It was designed to meet the aspirations of the local community, with a full understanding of the natural features of the site and a strong emphasis on biodiversity creation and good landscape design. A key feature of the masterplan is the provision of a permanent site for the Rutland Agricultural Showground, which will include sports pitches for local clubs as well as landscape enhancements. LDA Design has also been appointed as architect to design the first phase of the approved masterplan, for 140 homes, which includes two of LDA Design's own house types. The houses, designed to be light and spacious, have built in flexibility to meet increasing stringent standards of energy and resource efficiency. The design code ensures high standards are set for the housing quality and diversity of design, and gives developers like Hawksmead scope to modify its schemes to adapt to changing market needs and commercial considerations. 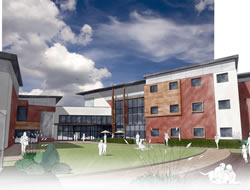 Aluglaze panels from Panel Systems have been chosen for the new All Saints Office Complex in West Bromwich. The panels were specified as part of creating a contemporary exterior to the building. 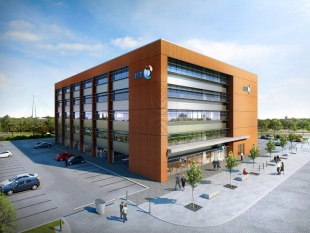 The five storey office block (141,000ft2), which is being built by Stoford Developments for BT Liberata, an IT services company, will house around 450 staff. The building will be an exemplar for sustainability, due to its BREEAM Excellent rating, which led to the choice of an A-rated Styrofoam core for the aluminium-glazed panels. Panel Systems produced 930m2 of bespoke Aluglaze panels, with a 2mm silver coloured aluminium face and the building achieved a very low U-value of 0.23 W/m2K. Danny Phelan, sales manager for Panel Systems, said: “This will be a strikingly modern office space, but with a strong focus on sustainability, which was why it was crucial that panels were chosen for the exterior that met both the aesthetic and environmental credentials. The building has been created by Bowmer and Kirkland, with Stoford behind the development of this £75m office complex. Aluglaze is an insulated infill panel comprising polyester-coated aluminium, which is vacuum bonded to a core of Styrofoam. Aluglaze is typically specified when aesthetic considerations are paramount and is available in all RAL and Syntha Pulvin colours. Panel Systems’ bespoke service means that Aluglaze can be specified to specific sizes and thicknesses to suit individual glazing systems and achieve U-values as low as 0.10 W/m2K. 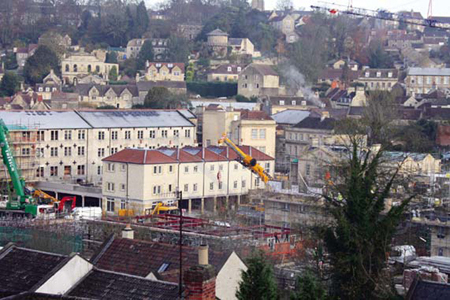 Titon’s HRV1 Q Plus whole house ventilation units and CME1 Q Plus continuous mechanical extract units have been installed in Kingston Mills, a prestigious conservation project, in Bradford‐Upon‐Avon. The project has recently been awarded a Royal Town Planning Institute (RTPI) award in the Local Regeneration and Renewal category. Titon’s ultra‐efficient HRV1 Q Plus ventilation units (with heat recovery) have efficiencies of up to 91% and are helping all the houses on the development comply with Level Three of the Code for Sustainable Homes, as part of a joint venture with Galliford Try, Linden Homes and Fuseland. Titon’s HRV1 Q Plus has been independently tested by the Building Research Establishment (BRE) and is Energy Saving Trust (EST) Best Practice compliant. The CME1 Q Plus incorporates a unique tilted impeller, single level ports and has a very large capacity of over 400m³/hr at reasonable static pressure, making it perfect for delivering System 3 of ADF ventilation for dwellings of up to approximately 300m² floor area. The unit’s unique design ensures it is not only very energy efficient but also very quiet too. Thanks to its ground‐breaking design, the CME1 Q Plus is also easy to clean and maintain and the unit can be serviced without the need to disturb any ductwork. The restored conservation project offers around 170 one, two, three and four bedroom homes together with shops, a restaurant and some office space in an important town centre, riverside location. The aim of the restoration project is to create a seamless extension to the historic and vibrant town centre and is the culmination of many years planning and consultation. 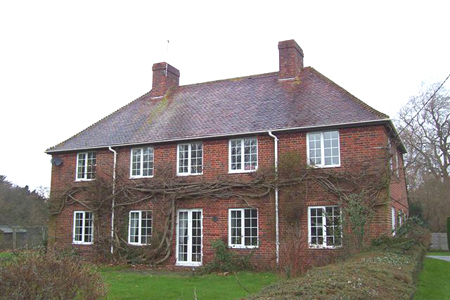 The Church of England Diocese of Winchester is to go over to recycled PVCU windows for all future replacements in its 250 clergy houses, with Network Veka member KJM as installer. Diocese houses manager Chris Mariner said the decision was in direct response to the clergy themselves, as well as the body’s environmental officer, who asked for a greener alternative. The Diocese, which covers Hampshire, Bournemouth, East Dorset and the Channel Islands, is a long-standing customer of Andover-based KJM. It has a rolling programme, replacing windows in about ten properties a year, some of which are still single-glazed. Its new windows will be based on the Veka Infinity system, which uses up to 80% recycled material locked inside a co-extruded outer layer of virgin PVCU. KJM and Network Veka fabricator Glazerite recently celebrated the first recycled PVCU windows ever to be chosen for a UK private house and Glazerite helped Luton to become the first borough in the UK to commit entirely to recycled PVCU for all future window replacements. Veka also last secured the first-ever major contract to install the recycled product, with the Places for People Group. 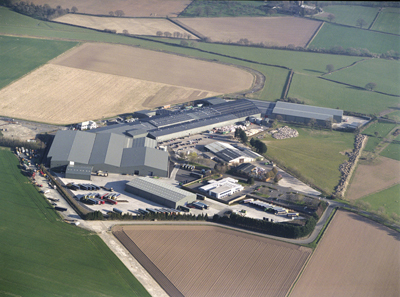 Kingspan Insulation has installed photovoltaic panels on the roof of its manufacturing facility in Pembridge. A total of 5,583m2 of roof space is now covered by the Kingspan Roof PowerPanel System, which was supplied by fellow company in the Kingspan Group, Kingspan Insulated Panels. Offering a design capacity of 800KW, the System will take up the burden of electricity needed to run the site’s lighting and its manufacturing lines. This initiative is one of many designed to reduce the company’s electricity usage. This started with the retrofit installation of roof lights to reduce electric lighting demand, improving the efficiency of the remaining luminaires and installing intelligent controls to cut down on demand. Electrical motors on the manufacturing lines have been replaced with energy efficient variable speed drives, compressors have been replaced with more energy efficient models and improved controls have been installed on the extraction system and compressors, which constitute two of the main energy loads on the site. In 2008 the company installed a gas-fired CHP plant which produces part of the base electrical demand of the site whilst delivering heat to the production processes. However, even after this step, the company was left importing significant amounts of grid electricity. This will now be history during daylight hours when the new photovoltaic array is delivering its carbon free power. Kingspan Insulation carefully monitors energy consumption throughout the Pembridge site, by means of energy meters for gas and electricity, with increased sub-metering to monitor consumption in production areas, and this monitoring will readily provide useful information about the effectiveness of the PV array. LDA Design, has been appointed by Dong Energy to undertake the Seascape, Landscape and Visual Impact Assessments (SLVIAs) for the Burbo Bank and Walney wind farm extension sites, two of the four remaining Round 1 and 2 offshore extension sites identified by The Crown Estate. The Burbo Bank extension site, covering an area of 40km2 and with a maximum capacity of approximately 250MW, lies off Liverpool Bay coast while the Walney extension site, which covers 149km2 and has a capacity of 750MW, is located approximately 15km off Walney Island, Cumbria, in the Irish Sea. The Crown Estate originally awarded five extension sites in May 2010. However, only four sites are now being taken forward and LDA Design is delighted to be undertaking the SLVIA for the three largest of the remaining four sites. LDA Design has also been working for developers SSE Renewables and RWE Npower Renewables on the proposed Galloper site located in the Thames Estuary. Galloper Wind Farm has a maximum capacity of 504MW covering an area of 174.9km2. LDA Design is also assisting with the landscape and visual assessment work associated with the onshore substations and grid connections for all three developments. 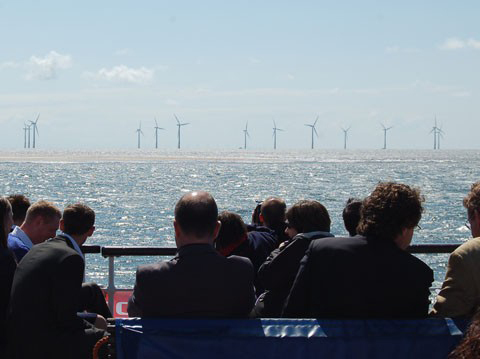 William Wheeler, director of wind energy, LDA Design said: "As part of our ongoing commitment to our offshore wind energy business we are delighted to have been appointed by Dong Energy to assist in delivering these important extension projects. We provide a wealth of assessment and associated services to help our clients plan, assess and deliver renewable energy projects." Reynaers Aluminium has played a significant part in the creation of one of the most sustainable office buildings in Europe by providing curtain walling systems, windows and doors for the new Severn Trent headquarters, in Coventry. The seven-storey, 38m-high headquarters building, built by BAM Construction, with the help of £6.5 million from Advantage West Midlands and support from Coventry City Council, has one of the lowest carbon footprints for any UK office building. Reynaers CS68 windows and Vision 50 doors were installed throughout the new development by Solaglas Contracting Midlands. Incorporating Reynaers three chamber system for improved thermal insulation, the windows and doors help to ensure heat retention and make the building more thermally efficient. Webb Gray Architects specified Reynaers CW50 curtain walling system to facilitate maximum creative freedom in their original design proposals. This in turn produced eye catching and appealing aesthetics and also provided maximum natural light exposure into the building. “This is one of the most exciting and innovative projects we’ve been involved in,” explains Paul Duffy, Reynaers head of UK sales. “By using our high insulation products such as CS68, they have managed to develop and build one of the most sustainable office buildings in the whole of Europe. “This will hopefully demonstrate to other developers the type of environmental gains and cost savings that can be achieved by specifying Reynaers products from the outset. A former ROC 9 Group control bunker built into a steep wooded hillside in Yeovil has been successfully converted into a sustainable and highly energy efficient five-bedroomed home with the help of Total Home Environment. The former group headquarters was constructed on the site of a Second World War base and was used as a practice bunker until 2001, when it was sold by the Ministry of Defence and later granted planning permission to convert the building into a domestic property in 2010. The accommodation has been arranged on four levels, two underground within the existing bunker and a two-storey timber frame new build, erected by homeowner, Brian Lemmy. After initially specifying and installing two GES Energy units from Total Home Environment it was found that due to changes on site the units would no longer provide sufficient ventilation to the property. One of the GES Energy units was then replaced with a GES Energy 2 ventilation appliance equipped with a counter-flow heat exchanger suitable for ventilation of living areas of up to 312m². Prior to the conversion, the interior was left untouched and still contained signs of the building’s original function such as radiation warning signs and a ventilation system, dormitories and steel blast doors. Ventilation to the bunker was provided within a ventilation and filtration plant room with all the original ROC plant remaining in good condition including the main intake fan which drew air through the filters into the trunking system running through the bunker. The original system and ducting has now been replaced with the high quality system from Total Home Environment, providing whole house ventilation with temperature efficiency and low energy consumption. The GES Energy heat recovery ventilation and GES Energy 2 ventilation systems were required to provide good levels of ventilation and a degree of zoning within the converted building, one unit ventilates the top extension and the other provides ventilation to the lower floors. Both appliances are equipped with a counter-flow heat exchanger with a recovery rate of over 90%. As the upper levels of the house are timber frame and maintain heat up to approximately 15°C, no heating has so far been required, however plans to install underfloor heating within the property to work alongside the GES Energy systems are to be carried out over the coming months. High performance window and door hardware from Siegenia-Aubi has enabled the creation of innovative and sustainable window and doors in a stunning £multi-million new build scheme in the heart of Tasmania. 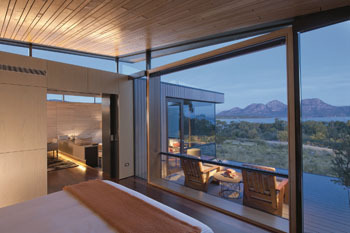 Work on the Saffire hotel and spa complex in an eleven-hectare site at the heart of the oldest national park in Tasmania was completed in June 2010. The scheme comprises 20 accommodation suites with a restaurant, lounge, boardroom, day spa and gymnasium. The £21 million Saffire project is the brainchild of award-winning Tasmanian architects Morris Nunn and Associates – a firm renowned for adventurous design and ecologically sustainable architecture. The buildings were designed to reflect their surrounding environment and evoke a connection to the sea. The glass used in the building has very low reflectivity, which allows residents to take in the stunning coastal setting both during the day and at night. Siegenia-Aubi’s national sales manager, Alastair Wheeler, said: “Sustainability sits at the heart of this project, and it was vital that every product used in the building process would deliver the energy efficiency, performance and passive heat gain requirements for the finished buildings. “Nothing has been overlooked – from construction management and long-term maintenance of the site to bushfire management, collection and conservation of rain water and the minimal use of night lighting. Award-winning Australian joinery firm Paarhammer Windows and Doors was selected on the basis of its top energy ratings to supply and fit the 64 windows and doors for the project. The Paarhammer team selected Siegenia-Aubi HS Portal, FS Portal and KFV hardware to create two lift and slide doors, a folding sliding door, a bi-fold window and 60 bespoke energy efficient pivot doors ranging up to 3m in height and created specifically for the Saffire project. Co-owner Edith Paarhammer said: “Siegenia-Aubi hardware is perfect for a project such as this. As well as offering huge scope for creative design, there is a proven track record and peace of mind regarding top quality product performance that only an established market leading manufacturer can provide.